In Part 1 we saw how Murray pointed out the conditionality of the Abrahamic, Mosaic, and New covenants were all the same, and how Shepherd built upon that to make works instrumental in our justification. In Part 2 we saw how Kline responded to these claims by arguing that Abraham’s obedience in the Abrahamic Covenant was a condition for the fulfillment of typological, redemptive historical blessings (not ordo salutis blessings). In Part 3 we saw how this related to Kline’s understanding of the Abrahamic Covenant as a royal grant covenant of works at the typological level. Part 4 drew out the resulting contradiction in Kline’s system – notably his belief that the Abrahamic Covenant is a promise covenant. Part 5 addressed a recent series on the Glory Cloud Podcast, demonstrating further contradiction in the Klinean system. In Part 6 I would like to present what I believe is the most consistent and biblical understanding of all the issues we have discussed thus far. Consider the example (recognizing that all analogies fail at some point) of this wedding covenant/contract. If you click the link, you will see that it is not a marriage covenant, but a contract regarding the performance of the wedding. This contract defines the terms and conditions under which The Salem Herbfarm and ___________________________ (hereafter referred to as the CLIENT) agree to the CLIENT’s use of The Salem Herbfarm’s facilities on __________________________ (reception/event date). This contract constitutes the entire agreement between the parties and becomes binding upon the signature of both parties. The contract may not be amended or changed unless executed in writing and signed by The Salem Herbfarm and the CLIENT. Once signed, this covenant confirms that the wedding will take place. Once confirmed, the contract is binding and cannot be amended or changed. “To give a human example, brothers: even with a man-made covenant, no one annuls it or adds to it once it has been ratified.” But the actual wedding still has to be performed, because this wedding event covenant is not the marriage union covenant, it simply promises the marriage covenant will occur. Likewise, the Abrahamic Covenant promises that the event of the Messiah will occur, but the New Covenant is the actual marriage union between the Messiah and his bride (from which eternal blessings flow). There are clear passages indicating that ‘the forgiveness of sins’ is unique to the New Covenant (“remember their sins no more”; Jer 31:34)… [OT saints] were forgiven truly but only by anticipation and were not yet propitiated in history… [T]he energies of the Spirit at Pentecost worked retroactively in the lives of OT saints. The declaration indeed is clear, that a new covenant is made according to which God engraves his laws on our hearts, for otherwise it would be in vain and of no effect… But it may be asked, whether there was under the Law a sure and certain promise of salvation, whether the fathers had the gift of the Spirit, whether they enjoyed God’s paternal favor through the remission of sins?… There is yet no reason why God should not have extended the grace of the new covenant to the fathers. This is the true solution of the question. Everyone who has ever been saved has been saved through the new covenant in Christ. Everyone who is saved receives a new heart, a heart of obedience, through the new covenant work of Christ… [T]he efficacy of the New Covenant, unlike that of previous covenants, extends to God’s elect prior to Jesus’ atonement. When believers in the Old Testament experienced “circumcision of the heart,” or when they were Jews “inwardly,” they were partaking of the power of the New Covenant. New Covenant union with Christ for Old Testament saints is no different from Christ’s atonement for OT saints. They received both in anticipation of its event in history. In the same way that someone may get a cash advance on a paycheck before they receive the paycheck, because it is guaranteed, OT saints received a soteriological advance on the New Covenant, because it was guaranteed by the Covenant of Redemption between the Father and the Son. 3. If we consider Abraham as the head of the covenant to that church and people: So he is a type of Christ, the head of the second Covenant. You know God covenanted with Abraham for his seed: So he doth with Christ for all his elect. God’s promise to Abraham was to give a seed to him, and an inheritance to his seed, viz. the land of Canaan, the land of Promise: So God did promise to Jesus Christ, that he should see his seed, Isai. 53. 10, 11. and to bring them to Heaven, Heb 2. 10 – Jesus Christ is the true head of the second covenant, he engageth and undertakes for all his seed: Abraham was but a typical head thereof. Mather noted “I confess [Abraham] is omitted by divers that have handled this subject [of typology]; for what reason I know not.” As we have seen in this series, the reason is because acknowledging Abraham as a type of Christ undoes the system of theology supporting infant baptism. Thus 17th century reformed theologians omitted him from any discussion of typology. The implications of this are worked out in the system of theology known as 1689 Federalism. The New Covenant alone is the Covenant of Grace. All other post-fall covenants are distinct from, but subservient to the New Covenant. The Noahic Covenant of Common Preservation provides a platform upon which the history of salvation unfolds. The Abrahamic Covenant promises who the Messiah will come from and also develops an elaborate typological kingdom to help us understand the work of the Messiah when he did come. The Mosaic Covenant was an addendum to the Abrahamic Covenant, further elaborating the terms upon which Abraham’s offspring would receive and retain the promised land and its blessings, typologically pointing to the obedience of Christ, the true Israel. Circumcision functioned the same way in both covenants. It bound Abraham and his offspring to loyal service to Yahweh according to the terms of the covenant. Thus it is associated with the works principle (Acts 15:10; Gal 5:1, 3; Rom 2:25 – see here for a longer discussion). The Abrahamic Covenant sustained Israel’s existence until it was fulfilled. Once the land promise was fully realized under Solomon, the kingdom was split and the 10 tribes were destroyed by the Mosaic curse. Judah was spared because one remaining Abrahamic promise had not yet been fulfilled: the birth of the Messiah. This promise was narrowed from the line of Abrahamic, Isaac, and Jacob down to the line of David (in the Davidic Covenant). Thus the tribe of Judah was spared. Once this promise was fulfilled in the birth of Christ, Judah was destroyed by the Mosaic curse (AD70). Christ is the mediator of the New Covenant, which is established on better promises: regeneration and the forgiveness of sins. It alone is the Covenant of Grace through which all men since the fall have been saved. I unpack all of this in much more detail in a 5-part series on the Reformed Northwest podcast. I also highly recommend reading Samuel Renihan’s dissertation From Shadow to Substance: The Federal Theology of the English Particular Baptists (1642-1704) to see much of this worked out in historical theology. It’s a really great work. Neonomian Presbyterians vs Antinomian Congregationalists? I am very thankful for the Glory Cloud Podcast. It is dedicated to explaining the theology of Meredith Kline. The hosts (the first 60 or so episodes are co-hosted by Lee Irons and Chris Caughey and then Todd Bordow later replaced Lee Irons) have a strong grasp of the law/gospel distinction. It is very refreshing to hear and I am thankful for all their efforts in putting the podcast together. This series of posts was actually prompted by a series of episodes (90-96ish) of the Glory Cloud Podcast. Hosts Chris Caughey and Todd Bordow walk through Kline’s understanding of the Abrahamic Covenant. Episode 93 specifically addresses the question Was the Abrahamic Covenant a Covenant of Works? They call out 1689 Federalism several times and invite baptists to interact with what they have said. So that was the motivation behind this series. The Genesis 15 oath ceremony necessarily means that the Abrahamic Covenant was unconditional. The NT confirms this in Rom 4 and Gal 3-4 because it says the Abrahamic promise is received through faith alone by grace alone apart from works. There is only one Abrahamic promise: eschatological salvation in Christ through faith alone. However, this promise is realized on two levels: the typological and anti-typological. Both are realized/received by unconditional grace through faith alone apart from works. Therefore Israel’s entrance into the land was not conditioned upon their obedience to the law but was a gracious gift received through faith alone apart from works. The Mosaic Covenant did not take effect when it was established in the wilderness but only started after Israel entered the land. At that point, remaining in the land was conditioned by the Mosaic Covenant, which they eventually broke (hence their exile). The New Covenant is a continuation of the Abrahamic Covenant of Grace – both of which are antithetical to the Old Covenant (which was of works). God does not say that “Abraham doesn’t have to do his half.” That is an assumption about the meaning of the vision, not something stated in the text. As we have seen Kline taught, per Gen 22:15-18 and 26:5, that Abraham did have to do his half in order to merit the redemptive historical blessings of the Abrahamic Covenant. Our expectations of what should or should not happen in any given situation does not get interpretive priority over explicit statements in Scripture explaining the meaning of that situation. Again, this is not letting Scripture interpret Scripture. What “stands out” to us in a text does not have interpretive priority over what the text states explicitly. “[W]hat characterizes the covenantal arrangement that God made with Abraham” should be determined by what God says characterizes the covenantal arrangement that He made with Abraham (the “interesting” verse that is being dismissed as irrelevant to the question). Again, as addressed in Part 4, these passages (per Kline) contrast our eternal inheritance in Christ with Israel’s tenure in the typological land of Canaan. Therefore they do not address the question of Abraham’s works relative to the typological, redemptive historical promises of the Abrahamic Covenant. In response, it is argued that there is only one Abrahamic promise. It is wrong to try to divide the Abrahamic Covenant up into multiple promises. Note, however, that co-host Todd Bordow directly contradicts himself when explaining Kline’s interpretation of Genesis 22:15-18. If there is only one indivisible Abrahamic promise then Bordow cannot make a distinction between New Covenant promises and typological promises in the Abrahamic Covenant. But in order to properly classify Abraham’s meritorious works, Bordow distinguishes between promises made about Abraham’s natural offspring and Abraham’s spiritual offspring. Again, that can’t be done if there is only one Abrahamic promise. Note that Kline saw multiple Abrahamic promises. “Thereupon, the Lord swore by himself that he would surely perform the full complement of covenant promises, culminating in the gospel promise of the blessing of the nations through Abraham’s seed (Gen 22:15-18).” (KP 300) Note well that Kline said the Genesis 22 covenant blessings that God swore to fulfill because of Abraham’s obedience included “the gospel promise,” which presents tremendous problems for his system. In Galatians 3, Paul refers to “the promise” not because there is only one Abrahamic promise, but because he is referring to one specific Abrahamic promise (Gal 3:8), which brings up a crucial point: In Galatians 3:8, Paul quotes Genesis 22:18. This simply does not fit Bordow’s Klinean framework. Remember, they interpret Paul’s appeal to the Abrahamic Covenant in Galatians 3 as teaching that eternal salvation in Christ, in the ordo salutis, comes from the Abrahamic Covenant – and therefore the Abrahamic Covenant is the Covenant of Grace. The text Paul relies on is Genesis 22:18, but Bordow says Genesis 22:18 is not talking about the ordo salutis! It is only talking about the historia salutis. From one perspective, Kline points out, Abraham’s works demonstrate his faith. So now he’s speaking of what we call the ordo salutis… James points out from that perspective, Abraham’s obedience only demonstrate his faith. They’re not a means to obtain the promise. And James is very clear, as Paul is. But here we have another perspective, it’s the perspective of the historia salutis, over the history of salvation as it works out in the different covenants. And so the problem is obvious. How then is this different from Israel? The text seems like Abraham is being blessed based on his own obedience. Kline’s solution is that in the historia salutis, or in what we would call typology, there is a meritorious character to Abraham’s works. Not in the ordo salutis, but in the typology of the Old Testament, God will use Abraham as a Christ figure. Therefore he will reward his works with only the typological promises. Not the eternal promises that were his in the ordo salutis. But, in the typology, which means just with national Israel in the Old Testament, just with the land of Canaan, Abraham’s work will have a means to an end. He will be sort of a federal head in a typological sense. His work will bring about the blessings for God’s people only on a typological level. And that is how Kline explains – and I think really the only way to understand this. Because of their misreading of Gal 3, they believe the Abrahamic Covenant, a promise covenant, promised the land of Canaan to Abraham’s offspring unconditionally: that it would be received through faith alone apart from works. In sum, it is argued that the works principle (obedience to the law) did not take effect until after Israel entered the land – that is, the Mosaic Covenant did not take effect until after the conquest by Joshua (40 years after Mt. Sinai). Until that point, the promise-grace principle determined their inheritance of Canaan. It is argued that the reason the first generation died was because they did not have faith, whereas the second generation was given the land because they had faith. Therefore the land was inherited through faith alone apart from works. The truth of this framework should be doubted, however, given all that we have seen above. The Abrahamic Covenant simply was not a promise-grace covenant, opposite in kind to one of works. The Klinean framework, on this point, does contain a partial (and important) truth: Abraham, a federal head, did earn the typological reward of Canaan for his descendants. However, Scripture never says that this reward was to be received by his descendants through faith alone apart from works. In fact, it says the opposite. First of all, Scripture nowhere teaches that the Mosaic Covenant commenced or took effect only after the Israelites entered the land under Joshua’s leadership. The Mosaic Covenant was in effect from the moment the oath was sworn, when the people said “All this we will do.” That is specifically why they offered sacrifices according to Mosaic law and why the first generation experienced so many curses and eventually death (Num 14:22-23, 29-30, 33; Deut 1:35; Ps 95:10-11). As T. David Gordon notes “While the land was eventually given to the Israelites, the terms of the Sinai covenant delayed their inheritance by forty years.” The role of the Abrahamic Covenant was to preserve the people as a whole despite their disobedience to Mosaic law. While they did experience the curses of Mosaic law in the wilderness, they were not utterly destroyed (per Mosaic law) because the Abrahamic promise had not yet been fulfilled (Ex 32:10, 13; Num 14:20; Deut 9:5-8, 13-14, 19, 25, 27-28; 28:26; Jer 7:33; Ps 106:8, 23, 44-45). Second, when we look at explicit statements about the Abrahamic Covenant, we see that its fulfillment is conditioned upon Abraham’s obedience (Gen. 17:1-2, 9, 14; 22:15-18; 26:5). But we also see that its fulfillment is conditioned upon Abraham’s offsprings’ obedience (Ex. 19:5-8; 23:20-22; Deut 4:1; 6:3, 17-18, 24-25; 7:12; 8:1-2; 11:8, 22-24; 29:13; Jer 11:5). Ex 23:20 “Behold, I send an angel before you to guard you on the way and to bring you to the place that I have prepared. 21 Pay careful attention to him and obey his voice; do not rebel against him, for he will not pardon your transgression, for my name is in him. Deut 4:1 “And now, O Israel, listen to the statutes and the rules that I am teaching you, and do them, that you may live, and go in and take possession of the land that the Lord, the God of your fathers, is giving you. Deut 7:12 “And because you listen to these rules and keep and do them, the Lord your God will keep with you the covenant and the steadfast love that he swore to your fathers. The term `eqeb, “because,” used in Genesis 26:5 (and already in the original revelation to Abraham in Gen 22:18) signifies recompense, reward (cf. Ps 19:11; Prov 22:4; Isa. 5:23). This strengthens the case for understanding this as a matter of meritorious works. Moreover, Genesis 26:5 describes Abraham’s obedience in language surprising in the Genesis context, the divine demand being denoted by a series of legislative categories such as are later applied to the laws of Moses. A particularly interesting combination of such terms together with `eqeb, “in recompense for,” is found in Deuteronomy 7:12 (cf. 8:20). Quite possibly then, Genesis 26:5 employs the terminology of covenant stipulations from the Sinaitic Covenant, where it describes an arrangement governed by the meritorious works principle, to reenforce the point that Abraham’s obedience was also to be understood as having such a meritorious character and that, as such, it was the ground of the reward enjoyed by his descendants. Deut 7:12 teaches that the fulfillment of the Abrahamic promise to Abraham’s descendants was conditioned upon their obedience to the law, which Kline identified as the meritorious works principle, and he said it functioned in the same manner as Abraham’s meritorious obedience. Therefore Abraham’s offspring had to obey, like Abraham, in order to enter and possess the land God swore to give them. Deut 8:1 “The whole commandment that I command you today you shall be careful to do, that you may live and multiply, and go in and possess the land that the Lord swore to give to your fathers. 2 And you shall remember the whole way that the Lord your God has led you these forty years in the wilderness, that he might humble you, testing you to know what was in your heart, whether you would keep his commandments or not. Deut 11:8 “You shall therefore keep the whole commandment that I command you today, that you may be strong, and go in and take possession of the land that you are going over to possess… 22 For if you will be careful to do all this commandment that I command you to do, loving the Lord your God, walking in all his ways, and holding fast to him, 23 then the Lord will drive out all these nations before you, and you will dispossess nations greater and mightier than you. 24 Every place on which the sole of your foot treads shall be yours. Your territory shall be from the wilderness to the Lebanon and from the River, the river Euphrates, to the western sea. Deut 29:10 “You are standing today, all of you, before the Lord your God: the heads of your tribes, your elders, and your officers, all the men of Israel, 11 your little ones, your wives, and the sojourner who is in your camp, from the one who chops your wood to the one who draws your water, 12 so that you may enter into the sworn covenant of the Lord your God, which the Lord your God is making with you today, 13 that he may establish you today as his people, and that he may be your God, as he promised you, and as he swore to your fathers, to Abraham, to Isaac, and to Jacob. Abraham’s personal reception of the promises made to him in covenant were contingent on his loyalty… Despite the fact that God promised Abraham’s descendants the land, this promise did not guarantee this promise for particular individuals, families or groups… In sum, there were senses in which the covenant with Abraham was both unconditional and conditional. Abraham was promised by divine oath that in one way or another his descendants would come out of Egypt and possess the land of Canaan. But at the same time, for particular individuals, families and groups to enjoy this promise, they had to fulfill covenant obligations. 4 “Do not say in your heart, after the Lord your God has thrust them out before you, ‘It is because of my righteousness that the Lord has brought me in to possess this land,’ whereas it is because of the wickedness of these nations that the Lord is driving them out before you. 5 Not because of your righteousness or the uprightness of your heart are you going in to possess their land, but because of the wickedness of these nations the Lord your God is driving them out from before you, and that he may confirm the word that the Lord swore to your fathers, to Abraham, to Isaac, and to Jacob. 6 “Know, therefore, that the Lord your God is not giving you this good land to possess because of your righteousness, for you are a stubborn people. It is argued that this passage teaches that the second generation entered the land not through obedience to the law but through faith alone apart from works. At first glance it certainly seems to teach that. However, note that this passage calls them a stiff-necked people (v6). That is a label for unrepentant, unbelieving people. So if this passage refers to the second generation, it must mean they were a rebellious, unbelieving people just like their parents, and that they entered the land through rebellious unbelief (which would contradict the Klinean view). I do not believe that is what the passage means. Rather, “you” is simply a reference to Israel corporately, including the first generation. This is clear from the rest of the chapter. Moses likewise uses “you” to refer to Israel corporately, including the first generation (despite the fact that they were all dead at the time), in Deut 3:26 and 4:21. The point of Deut 9:4-6 is that Israel collectively, as a nation, deserved to be utterly destroyed according to the terms of the Mosaic Covenant that God made with them, which would include the children. But because God had sworn to fulfill his promise to Abraham (because of Abraham’s loyalty/obedience), he spared the children. This is not what the nation deserved, therefore they should not be prideful. But he spared the children to see if they would obey, unlike their parents (Deut. 8:2 “And you shall remember the whole way that the Lord your God has led you these forty years in the wilderness, that he might humble you, testing you to know what was in your heart, whether you would keep his commandments or not.”). This is how the Abrahamic and Mosaic covenants relate. The Mosaic covenant simply elaborated upon the obedience required by the Abrahamic Covenant. But Abraham’s obedience as the federal head of the Abrahamic Covenant guaranteed that his offspring would not be utterly destroyed until they entered the land (through obedience to the law). New Covenant = Abrahamic Covenant? All of this provides sufficient reason to reject the claim that the Abrahamic and the New Covenant are the same covenant: the Covenant of Grace. As we will see in the next part, the Abrahamic Covenant did not include any ordo salutis blessings. I had a chance to discuss all of these matters with Todd Bordow in the Meredith Kline Facebook group, if you are interested in reading further. After this post was published, we also discussed these issues on Twitter. At this point, a tension arises in Kline’s formulation. He considers the Abrahamic Covenant a promise covenant that “connotes the principle of grace, the opposite of work,” wherein the “Inheritance of the promise was not through the works principle of the law (v.13), for that is contrary to the promise-grace-faith-forgiveness principle.” (KP 294) This holds true for Abraham at the “substratum” layer of eternal inheritance, which he receives through faith apart from works because of Christ’s work (in another covenant). However, this does not hold true for Abraham at the typological, redemptive historical level. Abraham did not receive the promised blessings at the typological, historia salutis level through faith apart from works, but rather through his works. Abraham was not made the father of the Messiah through faith apart from works, but rather through his works. How then can the Abrahamic Covenant be a pure “promise covenant” if at least some of its promises are received through the works principle? For this reason, some Klineans have tried to argue that “Kline’s point is that though it sounds like at times Abraham is given the covenant blessings through his works, that is not the really case, for Gen. 22 occurs many years after the promise of Gen. 15.” and that a works principle “was operative in the life of Abraham, but not ‘within the Abrahamic Covenant’ itself.” But that’s simply not what Kline said, as we have seen (Abraham’s obedience was “the basis for the Lord’s bestowing on him the blessings of the covenant.” (GHHM 102), etc). They appeal to passages such as the following. However, note that Kline explains the contrast in Galatians is between tenure in Canaan (type) and the inheritance of the Messianic kingdom (antitype). According to Kline, Paul is addressing “the salvation blessings offered in the Abrahamic Covenant” not the typological kingdom blessings offered in the Abrahamic Covenant. So appeal simply cannot be made to this passage to address the question of the typological kingdom/redemptive historical blessings of the Abrahamic Covenant, for it does not speak to it. In my opinion, Kline has simply misread Galatians 3. Paul is not at all arguing from the nature of the Abrahamic Covenant. He is not making an argument from the concept of a “promise” in general. Rather, he is making an argument from a very specific promise made to Abraham: that one of his offspring would come to bless all nations (Gal 3:8). He argues that this promised blessing to all nations is not through the law. For more on this, see Gal. 3:18 – Generic Law and Promise, or Sinai and Messiah? In addition to arguing from Galatians 3, Kline also argues from the oath ceremony in Genesis 15 that the Abrahamic Covenant is “of grace” and a promise covenant. A basic assumption of Kline’s is that the party who swears the oath in a covenant ceremony determines the conditionality of the covenant. How can this be reconciled with what Kline has said in Part 3? I don’t believe it can be. That’s why Klineans have tried to deny what Kline said regarding Abraham’s typological merit in the Abrahamic Covenant. If the Abrahamic promises, at the typological, redemptive historical level operated upon a works principle (as Kline said), the Abrahamic covenant was not a gracious promise covenant. Kline’s error is his assumption about oath ceremonies. The rationale is circular: The Abrahamic Covenant is a promise covenant. God alone swore the oath in the Abrahamic Covenant. Therefore God alone swearing the oath indicates whether a covenant is a promise covenant. In the Abrahamic Covenant God alone swore the oath. Therefore the Abrahamic Covenant is a promise covenant. Not only did Kline make an assumption about the Genesis 15 ritual, he also made an assumption about the Genesis 17 ritual. “It must be noted here that not all oaths of covenantal commitment function as ratification oaths. For example, the role played by the oath ritual of circumcision (Gen 17) is that of a supplementary seal added to the Abrahamic Covenant, which had been ratified by God’s oath on an earlier occasion (Gen 15).” Kline’s error here is violating the rule of the analogy of Scripture. Kline allowed his interpretation of a vision (implicit) to determine his interpretation of explicit statements. “The implicit teaching passages of Scripture will shape our theology, but if we allow implicit teaching to contradict what the Bible says explicitly and directly, we will draw erroneous conclusions.” Giving these passages their proper interpretive priority we learn that both Genesis 15 and 17 are foundational components of the progressively revealed Abrahamic Covenant. Genesis 15, answering Abraham’s question of how these miraculous promises could be fulfilled, represents God’s commitment to His part of the covenant. Genesis 17, on the other hand, represents Abraham’s part of the covenant (17:1; 18:19; note that it includes sanctions, Gen 17:14 cf. Ex 4:24-26). Gen 22:15-18, as we have seen, concludes the two by confirming that Abraham fulfilled his part, resulting in God swearing that His part will therefore be fulfilled, as 26:5 summarizes. It is worth noting that in his early work By Oath Consigned, Kline did give Genesis 17 proper weight. It is important to recall Kline’s earlier rule of thumb that you know a covenant is a law covenant whenever the vassal takes the oath, binding himself to obedience to the suzerain under threat of a curse. Since the Kline of BOC views circumcision as the vassal’s ratification oath, by this rule of thumb (as applied to Gen 17), the Abrahamic Covenant seems to be a law covenant. This means that circumcision was the rite by which the covenant of Genesis 17 was “cut”. It means further that circumcision symbolized the oath-curse by which the Abrahamic community confessed themselves under the judicial authority and more precisely under the sword of God Almighty. What is suggested by the broad structure of Genesis 17 is confirmed by the particulars about circumcision given in verses 9–14. Circumcision is called God’s covenant, his covenant in the flesh of his people (vv. 9 , 10 , 13). This identification of covenant with circumcision reminds us at once of the coalescence of the covenant with its oath-curse in the extra-biblical treaties. Moreover, the meaning of circumcision as symbol of the oath-curse is actually expressed in so many words in verse 14 . There the threat of the curse sanction sounds against the one who breaks the covenant by not obeying the command of circumcision: “(he) shall be cut off”. The use of the verb kārat in this specific description of the curse clearly echoes the idiom of cutting a covenant (kārat bÿrît) and it is an unmistakable allusion to the nature of the rite of circumcision. So in this, the primary passage for the interpretation of circumcision, the general and specific considerations unitedly point to the conclusion that circumcision was the sign of the oath-curse of the covenant ratification. In the cutting off of the foreskin the judgment of excision from the covenant relationship was symbolized. The broader import of circumcision is determined by the specific nature of that covenant of which it is declared to be a sign, and especially, since circumcision is a sanction sign, by the peculiar nature of the judgment in which that covenant issues. As for the covenant, it was a law covenant, not a simple guarantee of blessing but an administration of the lordship of God, a covenant therefore which confronted the servant with dual sanctions, curse and blessing (BOC 48). How does Abraham’s typological merit relate to the Abrahamic Covenant? It is important to note that Kline did not deny that the fulfillment of the Abrahamic promises (at the typological level) were conditioned upon Abraham’s obedience. He did not see Abraham’s typological merit as something that functioned outside of the Abrahamic Covenant. “Genesis 22:16 and 26:5 are relevant here as statements affirming a causal relationship between Abraham’s obedience and the fulfillment of the promises.” (KP 311) “[T]he promised program of the Abrahamic Covenant would proceed to unfold because Abraham had done this.” (KP 324) Kline referred to this arrangement as a royal grant made to Abraham. In his study of the Ancient Near-East, Kline saw two types of covenants of the time. Suzerain-vassal covenants were made between a king (suzerain, like Nebuchadnezzar) and lesser rulers of conquered kingdoms (vassal, like Jehoiakim; 2 Kgs 24:1). It imposed rules of perpetual obedience to maintain the status quo and included sanctions (punishment) for disobedience. Royal grant covenants were special covenants that kings (suzerain) made with exceptional rulers under them (vassal). The king granted the ruler a gift (land, etc) as a reward for his previous demonstration of loyalty. These two types of covenants can be combined into one under the idea of probation. A ruler can be placed under a suzerain-vassal covenant, but with the promise that after successfully demonstrating their loyalty over a period of time, they may receive a greater reward (grant). Kline referred to this as a proposal of a grant. Both suzerain-vassal and grant-proposal covenants are covenants of works. Kline saw the Noahic Covenant as one of several instances of a typological works-based grant covenant. It is, of course, the gospel truth that God’s dealings with Noah found their ultimate explanation in the principle of God’s sovereign grace. This covenantal grant to Noah came under the Covenant of Grace whose administration to fallen men deserving only the curse of the broken creational covenant (and Noah too was one of these fallen sons of Adam) was an act of God’s pure mercy in Christ. Kline saw the Abrahamic Covenant, at the typological level, as another instance of a typological grant for a servant’s covenant obedience. In the case of the covenants of grant, the message to be conveyed through the introduction of the works principle did not so much concern the nature of the messianic kingdom, but rather the role of the messianic king. The biblical data indicate that the Lord was pleased to take the exemplary obedience of certain of his servants and to constitute that a typological sign of how the obedience of the coming messianic Servant of the Lord would secure the kingdom and its royal-priestly blessings for himself and for his people. Abraham and David were recipients of such covenants of grant as rewards for faithfulness. Phinehas was another (cf. Num 25:11-13). Each of these individuals had personal hope of heaven only through God’s grace in Jesus Christ, only as a gift received by faith alone. But the conspicuous faithfulness of their lives in general or of certain specific acts of outstanding service they performed was invested by the Lord with typological significance so that they, with reference to a typological manifestation of the kingdom, pointed to Christ as one who also was under a covenant of works and received the grant of the kingdom for the obedient fulfillment of his covenantal mission. Common to all the displays of obedience that were rewarded with grants of the kingdom in a typological form may be discerned the motif of victory in the holy war against Satan and his earthly forces and followers. Actual military combat is at times involved. The promise of great reward to Abraham in Genesis 15:1 comes on the background of his warrior role in the conflict against the forces of the kings from the east (Gen 14)… It is as if these servants of the Lord had been confronted, like Adam, with a probation-mission, challenging them as guardians of God’s sanctuary to enter into judgment against the Adversary. By their valiant exploits in faithful performance of their mission they typified beforehand the obedient second Adam’s salvation-victory in his judicial combat with Satan and his hosts. It should be noted that the redemptive historical blessings that God granted Abraham in Genesis 22 upon successful completion of his probation are the blessings originally promised in Gen 12 and subsequently repeated throughout the intervening chapters. These blessings are promised in Gen 15. Recall Kline said “Common to all the displays of obedience that were rewarded with grants of the kingdom in a typlogical form… The promise of a great reward to Abraham in Genesis 15:1 comes on the background of his warrior role.” (KP 238) That is, Kline understood the Gen 15 revelation of the Abrahamic Covenant to be a royal grant for Abraham’s faithfulness. Throughout all of its iterations, the redemptive historical blessings of the Abrahamic Covenant are conditioned upon his obedience, his fulfillment of the covenant terms. Thus the Abrahamic Covenant, at the upper, redemptive historical level was a royal grant proposal (probation) successfully fulfilled. In Part 1 we saw how John Murray and Norman Shepherd interpreted the Abrahamic Covenant (like the Mosaic and New) as the Covenant of Grace requiring obedience in order for its promises to be fulfilled. How did Kline respond? First, he distinguished between the Old and New Covenants with regards to their principle of inheritance. The contrast between the old and new covenants repeatedly drawn by the apostle Paul is the same works-grace contrast found in Jeremiah’s familiar prophecy of the new covenant (Jer. 31:31-34). Identifying the old covenant as one that could be and was broken, the prophet declared that the new covenant would not be like the old covenant, a breakable covenant. It does of course happen that individuals prove false to the new covenant, but Jeremiah is referring to the kingdom order as such. The eternal antitypical kingdom of the new covenant, the kingdom of the righteous knowledge of God in the Spirit, is attained on the ground of the meritorious accomplishment of Christ, and its realization is thus made sure as a matter of guaranteed grace to Christ’s people, God forgiving their iniquity and remembering their sin no more. But the prototypical kingdom immediately in view in the old covenant obviously lacked that unbreakable guarantee, for once and again, and at last irrevocably, that kingdom was taken away from the covenant people by their removal into exile. Indeed, the kingdom order as such was ultimately terminated in a devastating divine infliction of the curse of the covenant. The principle operating here was manifestly altogether different from the promise-faith principle of God’s sovereign grace in Christ. Apart from a recognition of the operation of the principle of works in the old covenant it is impossible to account for Jerusalem’s desolation. As Moses had solemnly warned in the constitutional documents of the old covenant, the continuance of the Israelite kingdom in Canaan was conditioned on their covenant-keeping; corporate disloyalty against the Lord of the covenant would result in the catastrophic ending of the whole kingdom order. With the abolishing of the Mosaic order, the second level kingdom of the messianic age was initiated under the Lord’s New Covenant with the church. Jeremiah, speaking of the new covenant to be made in the coming days (Jer 31:31–34), drew a sharp contrast between it and the covenant made at Sinai (i.e., the stratum of it concerned with the typological kingdom). He described the Old Covenant as breakable and in fact as having been broken by Israel, which means that it was informed by the works principle of inheritance. And he asserted that the new covenant would be unlike the Torah covenant. It would be unbreakable; it would be an administration of gospel grace and forgiveness. While then we will want to affirm the New Covenant’s continuity with the foundational gospel stratum of the Mosaic economy and with the Abrahamic Covenant of promise, we must also acknowledge the works-grace discontinuity between the new and the old (at its typological level), the difference that Jeremiah so emphatically asserted. In this way Kline avoided making Leviticus 18:5 the condition of our salvation in Christ. But how does the Abrahamic Covenant relate to these two covenants and therefore our salvation? He saw the Abrahamic Covenant as a grace-promise covenant. By its identification with the gospel of Jesus Christ the Abrahamic Covenant is seen to be a promissory anticipation of the new covenant. Thus the New, not the Old Covenant, is identified with the Abrahamic. But what then of Abraham’s obedience? As Murray noted, the conditionality of the Mosaic is seen first in the conditionality of the Abrahamic, and the Mosaic appears to be a confirmation or continuation of the Abrahamic. To address this, Kline first explained that there are two different levels of fulfillment of the Abrahamic Covenant: typological and antitypological. At the typological level, the Abrahamic Covenant was fulfilled in Israel’s redemption out of Egypt and their inheritance of the land of Canaan. Their retention of the land was governed by the Sinai covenant, which operated upon a works principle (Lev 18:5) in contrast to a faith principle (Gal 3:12). Israel thus lost the land because of their disobedience and the LORD divorced them for their unfaithfulness. At the antitypological level, Jesus Christ, the true and only faithful Israelite obeyed the law perfectly, earning the antitypical eschatological land inheritance for his people, who receive it through faith alone. Kline acknowledges Murray’s point that covenant fellowship with God demands obedience. The question is how that obedience relates to the covenant promises. Reflection of the ethical glory of God must always be required of all, men or angels, who dwell in fellowship with him. Such divine demand for godliness is therefore found in covenants of works and grace alike. The precise kind of conditionality carried by the imposed obligations differs, however, in these two types of covenant. Using his distinction between the two different levels of the Abrahamic Covenant, Kline said that the gospel grace of the Abrahamic Covenant required obedience as a fruit of saving faith, but the gospel inheritance was secured not by Abraham’s obedience, but Christ’s. By distinguishing between the two different levels of the Abrahamic Covenant, Kline was able to correlate Abraham’s obedience as securing one, but not the other. Shepherd argued that Genesis 26:5 referred to Abraham’s obedience in the ordo salutis. In response, Kline argued that it referred only to the typological level of fulfillment – the historia salutis, not the ordo salutis. But if the ground of Israel’s tenure in Canaan was their covenant obedience, their election to receive the typological kingdom in the first place was emphatically not based on any merit of theirs (cf. Deut 9:5,6). Their original reception of this kingdom, as well as their restoration to it after the loss of their national election in Babylonian exile, is repeatedly attributed to God’s remembrance of his promissory commitments of grace to Abraham, Isaac, and Jacob (Exod 2:24; 3:6ff. ; 6:2ff. ; 32:13; Deut 9:27; 10:15; Lev 26:42), pointing to the coming Messiah and the new covenant. [T]he Lord’s word to Abraham (Gen 15:1) has the character of a royal grant to an officer of the king for faithful military service. God identifies himself by the military figure of a shield (cf. Deut 33:29; Ps 18:2), otherwise read as suzerain, and promises: “Your reward will be very great” (also read: “who will reward you very greatly”). The term sakar, “reward,” is used for the compensation due to those who have conducted a military campaign. In Ezekiel 29:19 it refers to the spoil of Egypt which the Lord gives Nebuchadnezzar as wages for his army (cf. Isa 40:10; 62:11). The imagery of Genesis 15:1 is that of the Great King honoring Abraham’s notable exhibition of compliance with covenant duty by the reward of a special grant that would more than make up for whatever enrichment he had foregone at the hands of the king of Sodom for the sake of faithfulness to Yahweh, his Lord. The broader record of the Lord’s dealings with Abraham includes numerous key expressions paralleled in the ancient royal grants to loyal servants: such a servant is one who obeys, keeps the charge, serves perfectly, walks before his lord. Another display of outstanding covenantal obedience by Abraham, the most remarkable of all, was the occasion for a second divine disclosure presenting the blessings of the Abrahamic Covenant as a divine grant for the servant’s work of obedience. At the conclusion of the sacrificial episode on Moriah, the Angel of the Lord, the very one who was at last to be the only Son and substitutionary ram of sacrifice, called out of heaven to Abraham: “By myself have I sworn, saith the Lord, because thou hast done this thing and hast not withheld thine only son that in blessing I will bless thee … because thou hast obeyed my voice” (Gen 22:16-18). Viewing this episode from the perspective of justification by faith in Christ, James expounded Abraham’s act of obedience as the work that demonstrated the vital reality of his faith (Jas 2:21ff.). But this event is to be seen from the redemptive-historical perspective as well as that of the personal, subjective experience of salvation. It had a special, decisive significance for the subsequent course of covenant history. This is suggested by the double affirmation, at the beginning and close of the oracle, that the promised program of the Abrahamic Covenant would proceed to unfold because Abraham had done this. That Abraham’s obedience had special historic significance as the basis for God’s future favorable action towards his descendants is confirmed by the Lord’s later repetition of the substance of this oracle, now to Isaac (Gen 26:2ff.). Having restated his commitment to fulfill the covenant promises to Isaac and his line, the Lord concluded: “because Abraham obeyed my voice and kept my charge, my commandments, my statutes, and my laws” (Gen 26:5, cf. v. 24). Here the significance of Abraham’s works cannot be limited to their role in validation of his own faith. His faithful performance of his covenantal duty is here clearly declared to sustain a causal relationship to the blessing of Isaac and Israel. It had a meritorious character that procured a reward enjoyed by others. The obedient Abraham, the faithful covenant servant, was a type of the Servant of the Lord in his obedience, by which he became the surety of the new covenant. Like the messianic Servant, the one whose meritorious service secured God’s blessings for the many who were his “seed” (Isa 52:15; 53:10-12), so Abraham was one, and the reward of his obedience was the blessings of the typal kingdom for the many who were his seed (cf. Isa 51:2). In sum Abraham’s works merited the reward of numerous natural offspring who would inherit the land of Canaan, as well as the reward that Abraham would be the father of the Messiah. 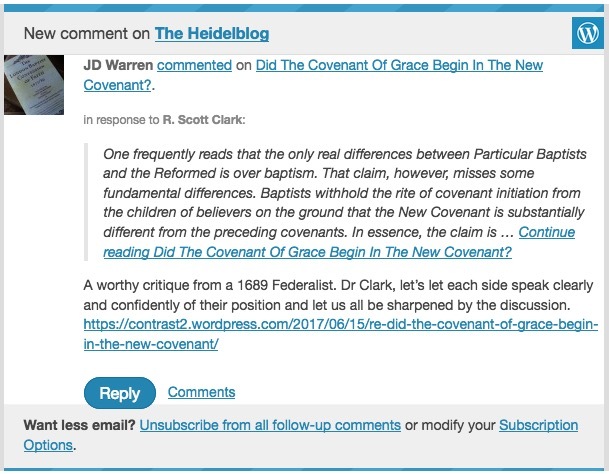 Any interaction with 1689 Federalism from paedobaptists has been very limited, so I am thankful that R. Scott Clark tried to do so in a recent post titled Did The Covenant Of Grace Begin In The New Covenant? Regretfully, though, he has fundamentally misunderstood the position. (I know that response can be annoying – please hear me out briefly). Our promised/established distinction refers to how the New Covenant was operative prior to the death of Christ. Before then, it existed as a promise and was effective to save all OT saints. It was effective and “existed” prior to its legal establishment as a covenant in the same way that Christ’s atonement was effective and “existed” for OT saints prior to Christ’s actual curse-bearing death on the cross. Yes, Abraham was justified in Genesis 15:6, but he was justified the same way we are: through membership in the New Covenant (from which he received a new heart, faith, and forgiveness of sins by the blood of Christ, the mediator of the New Covenant). 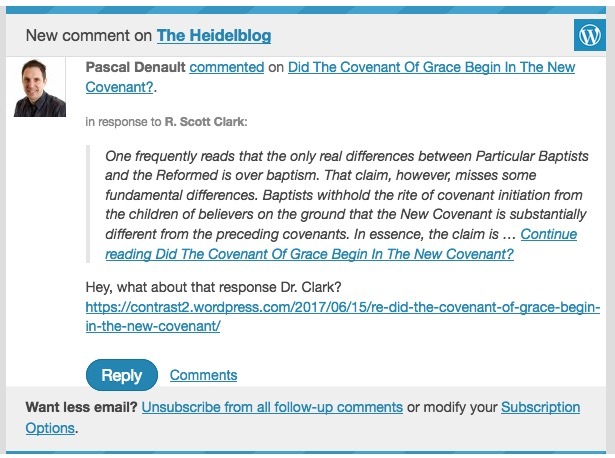 We appreciate the post, but we hope Clark is willing to receive correction as to what we believe so we can have a dialogue. Below is a more lengthy discussion of Clark’s problematic comments regarding “administration” for those that are interested. (Note, I tried commenting on his blog, but he banned me from the blog and blocked me on Twitter quite a while ago. He has also deleted two comments left by others on his blog asking him to respond to this post: 1 and 2).